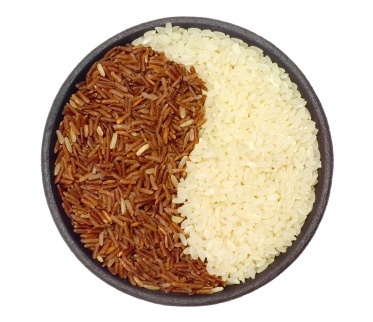 Brown Vs White Rice: Why does it matter? A cup (195 grams) of cooked brown rice has 218 calorie compared to 242 calories that the same amount of white rice has. The difference is not that significant. So why do we want to give up the good taste and the age-old habit? It’s because of the amount of fiber that brown rice packs. A cup of brown rice has 3.6 grams of fiber (around 14% of our daily need) compared to 0.6 grams that white rice has. Our body does not digest fiber, so part of the caloric energy in fiber is not used by our body and is passed through the digestive tract unabsorbed. The net calorie intake is always lower when you substitute your white rice to the brown one. AND: It also tends to make you fuller faster and helps you pull a swift bowl movement (a big plus). Enjoy food without making your body pay later. There is nothing wrong in food we eat as long as we put a good balance to it. This entry was posted in Health tips by Kamakshi. Bookmark the permalink.